Bill Scott was interviewed in his home in St Andrews in 2016 on behalf of the St Andrews Preservation Trust. 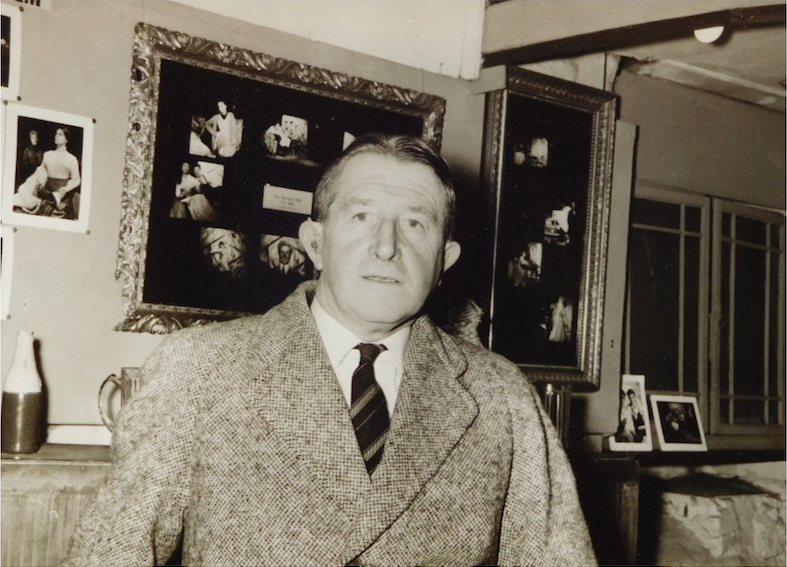 “My father [William Robertson Scott] was born in 1890 at Cameron and he was educated at Cameron village school and then he went on to become an apprentice at Mount Melville Estate, as a gardener. 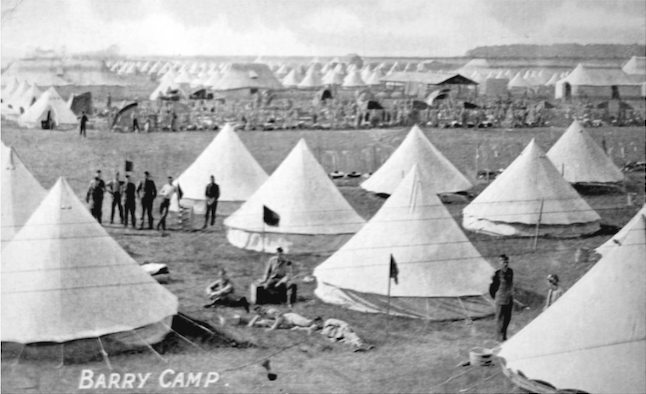 “In 1914 when he was twenty-three he came into the Lammas Fair and he was recruited, or volunteered, to join the Army. And he joined the Fife and Forfar Yeonmanry to begin with, which was later subsumed into the 14th Royal Highlanders The Black Watch. “After training he went down to England then off to Egypt and then he went to Suvla Bay but never landed and returned back to Egypt. “He then went into Palestine and, apparently, from what he told us and I think it is recorded in the history of the Fife and Forfar Yeomanry, that they actually relieved Jerusalem from the Turkish Occupation. “And he was then transferred back to the United Kingdom then off to France where he was wounded by shrapnel in the leg and bullets in the arm on 2nd September 1918 at a place called Moislains, in Norther France. “He then, of course, went into a field hospital and, after the war, he continued his recovery and convalescence at Bangor hospital and that continued, off and on as an inpatient and an outpatient, until 1927. Moislains is near Peronne. It lies on the River Tortilla, and just east of the village runs the Canal du Nord. East of the canal, the ground rises steeply to a ridge of high ground. After arriving in France, a period of leave was granted; some of the men had not been home since leaving England in 1915. 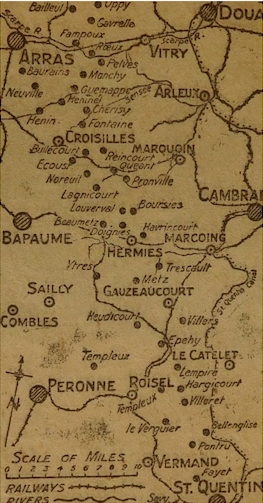 On 1st September the Battalion went into line at Moislains, the area from which the Germans had been pushed that morning. Attack the enemy trenches of the far side of the Canal du Nord, including a strong system of German trenches some way behind the first ones, and finally take the crest of the Moislains ridge. Despite heavy machine gun fire, they got across the canal and up the slope, driving the enemy out of some wooden huts. Advancing towards the second system of German trenches, the Battalion came under heavy machine gun fire from Moislains and from behind. The village had never been fully cleared and the enemy remaining there had moved quickly behind the Battalion opening fire on them. They were also subjected to heavy artillery fire. To advance under such conditions was out of the question and as casualties by this point were very heavy, there was no alternative but to withdraw. 14 officers and 157 other ranks wounded. Bill Scott’s father was one of the 157 wounded soldiers. The two sons of Alexander and Helen Patterson of 2 South Castle Street, Alexander William Patterson enlisted in June 1915. Alexander, the elder of the two brothers, aged 25 and his younger brother William was just 18. Alexander survived the war, however his young brother William was killed on the 25th of April 1917 aged 20, during a major offensive at Arras. The family were later sent a bronze memorial plaque, commonly known as the ‘dead man’s penny’. 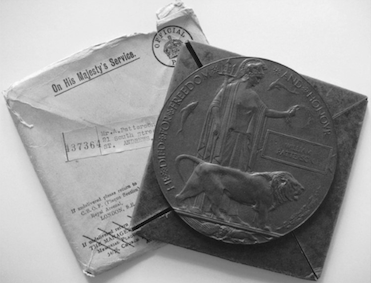 The plaque was sent to the relatives of those who had fallen during the War. It depicts an image of Britannia holding an oak spray with leaves and acorns, an imperial lion, and two dolphins representing Britains’ sea power. Directly under the lion is the emblem of Imperial Germany’s eagle being torn into pieces by another lion. Just the name was engraved on the plaque – no rank was given to show equality in the sacrifice made. 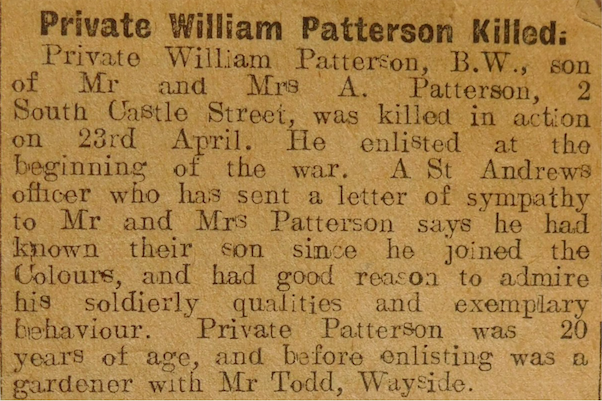 Private William Patterson, B.W., son of Mr and Mrs A Patterson, 2 South Castle Street, was killed in action on 23rd April. He enlisted at the beginning of the War. 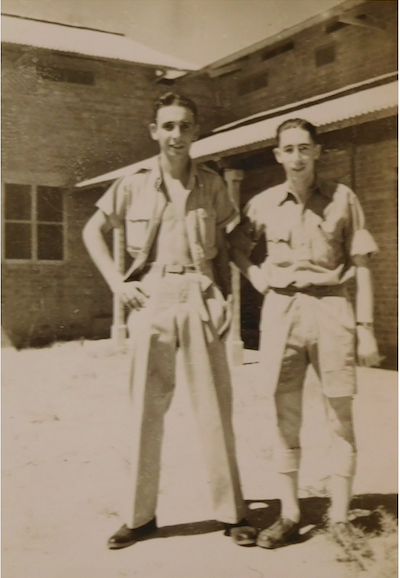 A St Andrews officer who has sent a letter of sympathy to Mr and Mrs Patterson says he had known their son since he joined the Colours, and had good reason to admire his soldierly qualities and exemplary behaviour. Private Patterson was 20 years of age, and before enlisting was a gardener with Mr Todd, Wayside. Text prepared by Fiona Gray and Kate Owen. On the 11th November at 11 o’clock, hostilities between the Allies of World War I and Germany ceased. Photograph courtesy of the St Andrews Preservation Trust. Legislation introduced at the outset of war severely curtailed the civil liberties of non-British-born subjects (even naturalised citizens who had resided in the UK for decades). Suspicion of outsiders, particularly of German descent, was high. One St Andrews family targeted by the authorities was the Rusacks. William Rusack had established the well-known Rusack’s Marine Hotel after settling in St Andrews with his Scottish wife Janet in 1874. Some forty years later, he and his family were suspected of being German spies. William also owned Bogward Farm. The farm supplied fresh produce to the hotel, and William’s son Harry kept a number of pigeons there. “During the 1914 war Papa was suspected of sending pigeon messages to Germany, and a hydraulic ram which my husband had designed to water the garden… was duly inspected by the Town Councillors. Papa, who didn’t know a pigeon from a duck, was forced to destroy every pigeon. “Another ridiculous assusation, because of being of German extraction [was] when the hotel was requisitioned by the army for conferences. One day there was a special one in the huge dining room, and soldiers were stationed round the hotel. It was rumoured that Mr Rusack was being tried for his life, and a crowd gathered on the Links in front of the hotel. William and Janet’s son Louis signed up in 1915. The youngest member of the Rusack family, he enlisted with the 7th Battalion The Border Regiment and landed in Boulogne on the 15th of July 1915. He was killed at the Somme on the 4th of July 1916, aged 28. Louis’ brother David was a Lieutenant in the Scottish Horse (13th Battalion Black Watch) and was wounded in action in November 1916. His brother Albert was a surgeon on HMS Fearless. 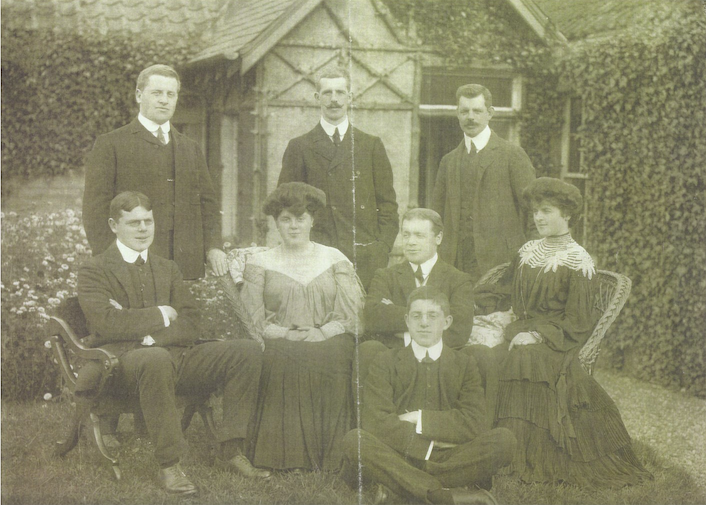 Members of the Rusack family c1900. Sitting in the front row on the ground is Louis who was killed in action in 1916.